Ajinkyatara is also known as �Fort of Satara�. It can be seen from anywhere in Satara city. Ajinkyatara is built on the mountain, which belongs to �Bamnoli� range that starts from Pratapgad. The geographical significance of all these forts is that, it is impossible to travel directly from one fort to another. All the forts in this region are comparatively less heightened. Ajinkyatara was the fourth capital of Marathas, the first one being Rajgad, followed by Raigad and then the fort of Jinji. Shilahar King Bhoj-II constructed it in the year 1190. This fort was captured by Bahamanis and then by Adilshah of Bijapur. In the year 1580, wife of Adilshah-I, Chandbibi was imprisoned here. Bajaji Nimbalkar was also kept at same place. During expansion of Swarajya, Shivaji Maharaj ruled over this fort from 27th July1673. Shivaji Maharaj had stayed on this fort for two months due to ill health. After unfortunate death of Shivaji Maharaj, Aurangjeb invaded Maharashtra in 1682. In 1699 he beleaguered the fort. Prayagji Prabhu was the chief of the fort at that time. On 13th April 1700, the moguls dug trenches and used explosives to blow the bastion named �Mangalai�. They succeeded as the ramparts were destroyed and some Marathas were killed. Fortunately Prayagji Prabhu escaped with minor injuries. At that moment there was another explosion and the broken ramparts fell on the moguls. The war progressed and Subhanji took the fort on 21st April 1700. It took four and half months for the Moghals to win the fort. It was renamed as �Azamtara�. Tara-Rani�s army again won this fort and named it �Ajinkyatara�. Moghals took back the fort again. In 1708 Shahu took the fort by treachery and declared himself as the ruler. In 1719, mother of Maharaj Shahu, �Matoshri Yesubai� was brought here. Later the fort was inherited by Peshwas. After death of Shahu-II, the British captured the fort on 11th February1818. 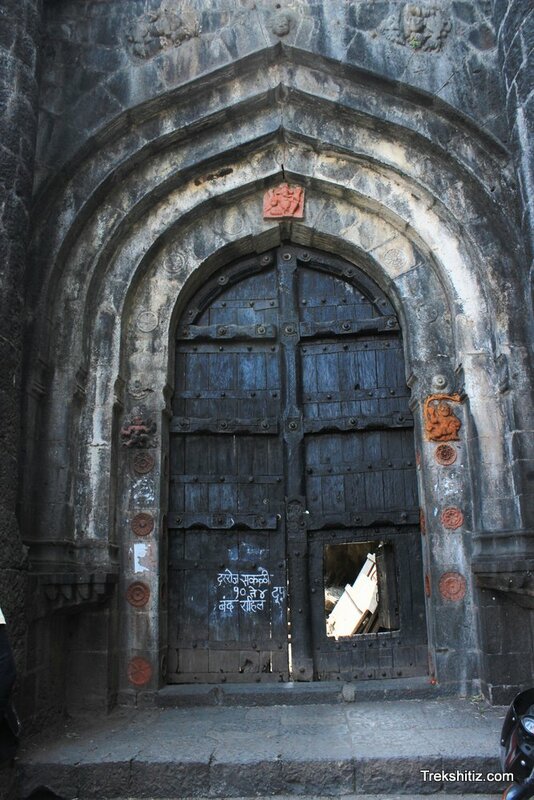 There are two entrances on Satara side of fort. One entrance is in good condition. Both bastions still exist. At the right side of the entrance there is Hanuman temple. This is the best place to stay for. Water is not available on the fort. On the way towards left side we see Mahadev temple. Opposite to it there is office of Prasarbharati and two towers. After moving further, we see a board reading��way towards �Mangaladevi temple�� on the left side. Here we find the palace of �Tara Rani� and one big storeroom. At the end of this road there is Mangaladevi temple. Opposite to it is the Mangaladevi bastion. Many sculptures are found around the temple. There are two entrances at the North. The way to these entrances is from Satara-Karad road. Near the entrances there are three lakes. After seeing the fort we can come down by same way. From fort we can see plateau of Yavateshwar, forts of Chandan-Vandan, Kalyangad, Jaranda and Sajjangad. It takes one and the half hours to see the fort. As the fort is situated in the city itself, there are many ways to reach the Fort. We can take any bus from Satara station, which goes via �Adaalat Wada� and alight at Adaalat Wada. Satara to Rajwada bus service is also available. Every 10 minutes a bus plies from Satara to Rajwada. The distance between the Adaalat Wada and Rajwada is of 10 minutes. From Adaalat Wada, a proper way leads us to the main entrance. Good tar road has also been built. All the ways towards the fort take approximately one hour to reach. One should arrange food for own. Not available during summer and winter.